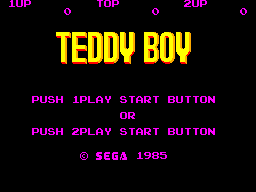 Teddy Boy was one of the early Card based games before being released a year later on Cartridge. The game itself is a port of a popular Japanese arcade game called Teddyboy Blues which iself was a reference to a hit song in Japan by Yohko Ishino which at the time was highly unusual for a game as uit's purpose was to promote the singer and the Teddyboy Blues single release. The console port of the arcade game released outside Asia though bears no reference whatsoever to the singer which is a good thing as we would all probably be wondering what the heck does this game have to do with Japanese pop music? 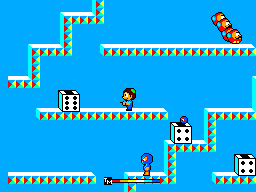 The aim of each level (of which there are 50 before they loop) is to shoot every single enemy within the time limit which pop out of numbered dice scattered throughout the maze. The number on the dice shows how many enemies are yet to pop out of it. When the enemy is shot, it shrinks and you must collect the shrunken enemy before it turns into a bug that eats into your remaining time. The level ends when all enimies have been eliminated and your remaining time is added to your overall score. In between there are bonus stages where you shoot purple dice to find assorted toys of differing point values, the aim of which is to find the green dragons which are worth a cool 10'000 points each. Compared to other games out at the time for the Master System, the graphics are not impressive. They are very basic with one colour backgrounds that change with every level. The character animations however are good although flickering will occur when there are more than a certain number on the screen at the same time. 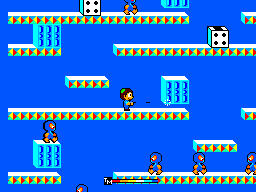 Also its worth noting one of the enemies is a mosutached red helmet head (which appears in a group of 4) that is also found in Alex Kidd in Miracle World, the animation when the player dies is also similar to that in the aforementioned game, this suggests that this game was made by the same team that brought us the first Alex Kidd. The game has one tune which repeats itself in every single level, its catchy at first but it will get very irritating after about 5 or 6 levels of the game. The controls (like the graphics) are basic, Button 1 fires a little gun to shrink enemies and button 2 jumps. Despite their basic nature, they respond very well and considering the game requires a lot of moving round the level and quick decision making, this is a good move. Overall Teddy boy is a very average action shooter with one annoying tune with not much replay value once you can get past the first 50 levels without too much trouble. But its worth a place in your SMS collection simply for the weird story behind the game's origins.